In Apple Music's For You section, Apple Music provides New Music playlist and Chill Mix playlist based on your music taste and listening history. The more you listen, the better result you will get. Besides, Apple Music also provides Friday's playlists updated on every Friday as well as Artist Spotlight playlists. You can add the playlist to your iTunes library and download for offline listening. With Apple Music Converter, you can directly download all the songs in your favorite Apple Music playlists as MP3 or M4A files. In Apple Music's For You section, Apple Music provides different playlists to help you discover new music and enjoy your favorite music. The New Music Mix playlist is used to help you discover new music from artists that Apple thinks you like, and it will be updated every friday. The Chill Mix playlist is used to help you relax and unwind by providing you a selection of songs tailored to your music taste, and it will updated every Sunday. Both New Music Mix playlist and Chill Mix playlist include 25 songs. If you like the playlist, you can add the playlist to your iTunes library, and it will be saved as a static playlist. If you like some songs in the playlist and you haven't added to iTunes library or saved the playlist, you may need some time to find them back. Saved playlist will be displayed as standalone playlist in "Apple Music Playlists" section in library tab. To improve the results in the New Music Mix playlist and Chill Mix playlist, there are simply two ways. Listen more to songs and love/dislike the song. Besides, Apple Music also provides weekly playlists (Friday's playlists) and Artist Spotlight Playlists made by music experts to help you discover more music. All the playlists in the For You section can be downloaded on PC or mobile for offline listening. On Windows and Mac, you can simply click the playlist to view the details, then click the blue "+Add" button to add entire Apple Music playlist to iTunes library. After click, the "+Add" button will be changed to a download button. Click the download button and all the songs in the playlist will be downloaded. Downloaded songs of the playlist will be saved in your iTunes Media folder's sub-directories. In iTunes Media folder, Apple Music folder will be created, then artist name folder will be created and the final folder that stores downloaded Apple Music songs is album folder. The path is something like this: X:\iTunes Media\Apple Music\Artist\Album\Song.m4p. The way of downloading Apple Music playlist on iPhone, iPad, iPod Touch and Android mobile is similar. Open a playlist and then tap the red "+Add" button and it will be changed to a download button. Tap the button to download entire playlist. Apple Music songs come with DRM protection and can be only played on authorized devices which meet Apple Music's minimum requirements. So even if you have downloaded Apple Music songs on PC, you can't synced to iPod Nano, iPod Shuffle or iPod Touch 4 or copy to PSP, Sony Walkman and MP3 players for listening. 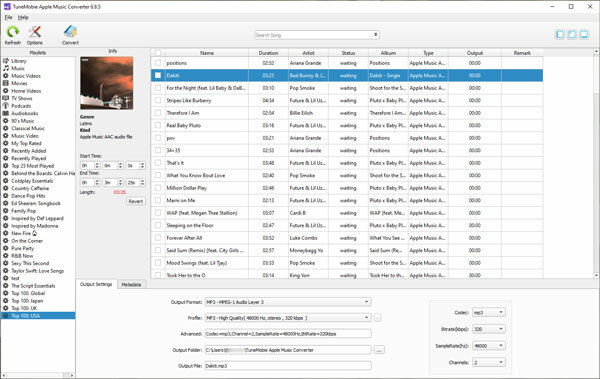 Apple Music Converter is the right software solution to help you slove this problem. Apple Music Converter can directly convert any Apple Music songs in your iTunes library, including the downloaded ones and the ones you only added to iTunes library but haven't downloaded (You need to download to iTunes library first on Mac), to plain MP3 or M4A format with all ID3 tags retained. 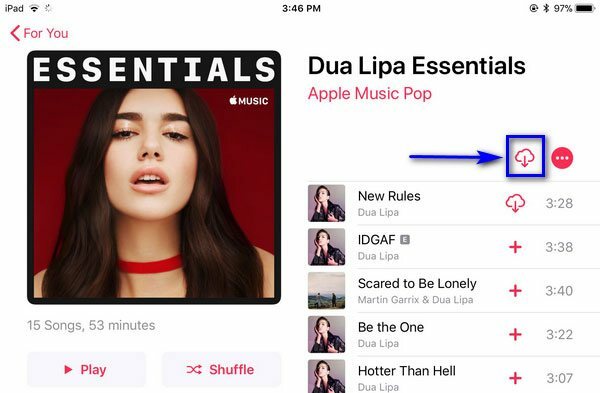 You can browse Apple Music For You section, add favorite Apple Music playlist to iTunes library and them use Apple Music Converter to download the songs in the playlist directly to computer as MP3 or M4A. Apple Music Converter performs at up to 16X faster conversion speed to help you download all songs in Apple Music playlists to computer and convert as MP3 or M4A. Besides, before downloading, you can set output file name to rename and sort output MP3/M4A files in batch using ID3 tags and characters. 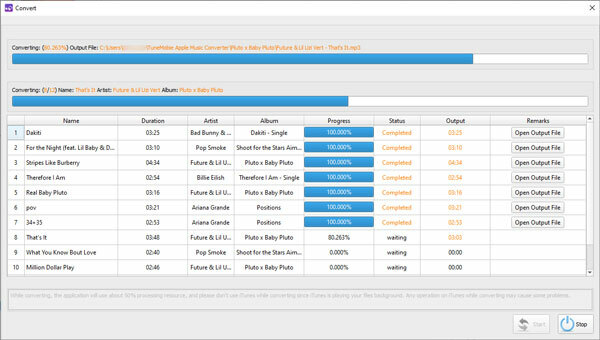 Apple Music Converter is available for Windows and Mac, fully compatible with latest Windows 10, macOS Mojave and iTunes. Below is an easy guide to show you how to download entire Apple Music playlist and save as MP3 or M4A. Step 1: Launch iTunes, go to For You section, browse any playlist you like and add them to iTunes library. You don't need to download them for conversion. After adding playlists, exit iTunes and install Apple Music Converter. Step 2: Launch Apple Music Converter and iTunes will be opened automatically. Do not operate iTunes if the converter is running. Step 3: Apple Music playlists and your own created playlists will be listed in Apple Music Converter's left bottom. Click the playlist and tick the top checkbox in the information bar to select all the songs in the playlist. Step 4: Choose MP3 or M4A from output list. Choose output quality in profile list depending on your need. Click Options to adjust conversion speed if necessary. Step 5: Click Convert button to start downloading Apple Music playlists as MP3 or M4A. Click “Open Output File” to open output folder. Now, you have successfully downloaded all the songs in Apple Music playlist as MP3 or M4A, and you can sync or copy the output MP3 or M4A files on all kinds of devices and enjoy them witout limitation. Get the free trial version to have a try now.